The Parthenon (Ancient Greek: Παρθενών) is an iconic temple on the Athenian Acropolis, dedicated to the goddess Athena, patron of Athens. Legend has it that Athena and Poseidon competed to become the patron deity of the city, still nameless at that time. Everyone would give a gift to the Athenians and they would choose which one was the best. The god of the sea made a spring flow, but the water was salty. Instead, Athena offered an olive tree with silver leaves, beaded with black and juicy olives. The Athenians chose the olive tree and Athena became the patron saint of the city and gave it her name. 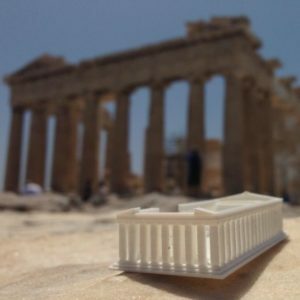 Built between 447 and 432 BC, when the Athenian Empire was at the peak of its power, the Parthenon is the most important surviving building of Classical Greece and is generally considered as the highest point of the Doric order. 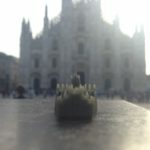 The model was printed in collaboration with 3DItaly Milano, 3D printing shop in my city.